Description: When PRR K4 1361 was removed from display here, it was replaced with another Pennsy classic, this GP 9, no 7048, which now sits behind a chain link fence at the park in the crook of the curve. 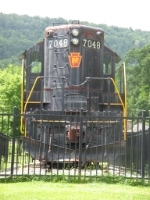 Description: PRR GP9 7048 on dislay at Horse Shoe Curve in Altoona, Pa. Description: A view of Horseshoe Curve from the eastbound Three Rivers with lots of waves from the park visitors. Description: Manifest end going up and around Horseshoe Curve. Icon Pennsylvania RR GP9 in the foreground. Description: The 7048 which has replaced the K4 1361, stands at display at the Curve. Description: The pensy GP9 watches over horseshoe curve. Description: This old Pennsy Geep on display at Horseshoe Curve is really in need of paint and correct lettering. It also wouldn't hurt to lock the cab doors. Description: Old Geep rusting away on the mountain. This loco replaced PRR K4 1361 when it was put into excursion service in the 1980s. Description: The locomotive that replaced the K4s 1361 in the mid 80s. Notice that the Keystone and the Pennsylvania along the side has faded. Description: A westbound stack train rounds "The Curve" in a steady snow storm. Description: A view of the 7048. 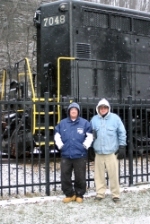 As you can see the locomotive was painted over but does not have the road name, number, or the Keystone on either side. Description: Two sets of helpers are on the rear of 538 as they descend the grade on track one with the GP9 to the right. Description: The GP9 watches a pair of helpers head east on track one and 18N continues heading east on track two. The helpers heading east were on the 67Z earlier. Notice the guy in the yellow hard hat as he cuts the weeds on the other side of the fence to make taking pictures much more easier:) .